This week is UNGA week, short for United Nations general assembly. More than 140 world leaders converge on the UN headquarters at Turtle Bay in midtown Manhattan to discuss some of the many urgent matters of the day. Each head of state or government will have 15 minutes to say what is on his or her mind at the assembly’s famous green marble podium. It is a restriction often abused, though seldom as much as by Muammar Gaddafi in 2009 when he spoke for more than 90 minutes. This year the general assembly will take place in a chamber newly renovated at the end of a seven-year overhaul. The gold-leaf backdrop behind the UN insignia has been replaced at huge expense – the original had become caked in nicotine from decades of cigarette and cigar smoke. Smoking is now prohibited in the chamber and the ashtrays have been removed from the delegates’ desks, one of the first changes to the 1940s design. Another UN tradition is for leaders of countries with strained bilateral relations to have carefully orchestrated “chance encounters” in the corridors around the chamber. Last year there was great anticipation of such a meeting between Barack Obama and Iran’s newly elected president, Hassan Rouhani. In the end, their contact was limited to a last-minute mobile phone conversation while Rouhani was on the way to the airport for his flight home. This year an encounter between the pair is even less likely as nuclear talks between Iran and the major powers, due to continue on the sidelines of the general assembly, have hit a rough patch. 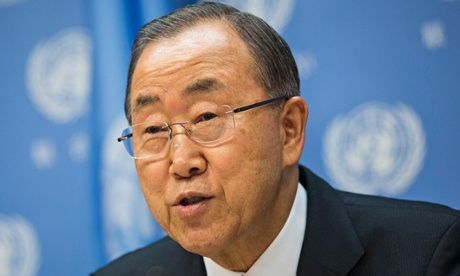 Ban Ki-Moon, the UN secretary general. 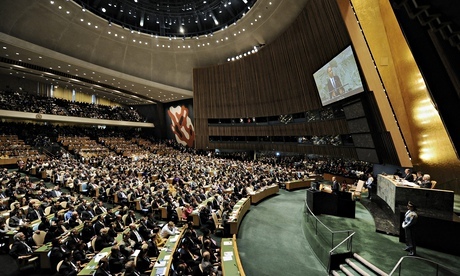 Climate summit chaired by the UN secretary-general, Ban Ki-moon. Intended as a forum to hear climate action commitments from governments, local leaders and the private sector in an effort to build political will for a new global climate agreement in 2015. It is expected to last most of the day. Obama is expected to arrive at 12.50pm and to speak soon after. David Cameron is to speak at midday. 2pm: Obama to address Clinton Global Initiative annual meeting. The US president is expected to explain what his administration is doing to strengthen civil society around the world in the face of mounting restrictions under authoritarian regimes. 4.30pm: Special session on Somalia. Ban will chair. General assembly debate, day one. All 140 of the heads of state and government attending will have their chance to speak for 15 minutes. After Ban, Dilma Rousseff of Brazil will speak, followed by Obama. UN tradition dictates that Brazil gets to go first because it was such an enthusiastic participant at the UN’s founding in 1947 – chairing the first two assemblies – that it managed to nail down first-speaking privileges in perpetuity. The US is next as it is the host. Obama will speak at about 10am. Other speakers include Qatar, France, Turkey, the UK and Australia. 3-5pm: security council session on Isis. Obama will chair a special session aimed at producing a binding agreement requiring action from member countries on cutting off the flow of money and manpower to the Islamic State (Isis). It will be only the second time a security council meeting has been chaired by a US president (the first was also chaired by Obama, in 2009, on stopping nuclear proliferation) and only the sixth time the council has met at head of state or head of government level. 3-5pm: Rouhani meets foreign policy experts. The Iranian president will be speaking and taking questions at a hotel near the UN building. General assembly debate, day two. Speakers include Iran, Ukraine, Egypt, Latvia, DRC and Iraq. 11am-1pm: summit meeting on Ebola. Convened by Ban, with Obama to speak at 11.15am. Leaders are expected to pledge contributions to the effort to try to contain the spread of the virus. Afternoon: meeting on the veto. France will host a session on the security council veto. The French want the permanent five members to give up their veto powers in cases of mass atrocities. The initiative is unlikely to get very far. Session on UN peacekeeping. The US vice-president, Joe Biden, will chair a session on UN peacekeeping. It aims to bring together financial backers of peacekeeping operations and main troop contributors.